Due to the timeless and enduring nature of CCR's music, new generations of fans are asking many of the same questions about the band now as were asked way back when. Some of the those questions are answered here. Creedence Nuvall was the actual name of a friend known by Tom Fogerty when he worked at Pacific Gas and Electric. Clearwater was borrowed from a phrase in a beer ad that John Fogerty liked. Revival came from the fact that the group had been performing together for nearly ten years, and they were finally about to have a shot at the big time. How was the vocal sound on "Suzie-Q" and "Midnight Special" done? The vocal track was equalized to obtain that sound during production. How was the sound at the beginning of "Run Through The Jungle" made? Guitar feedback and piano recorded and played backwards. Who in the band was using Sun speaker cabinets onstage instead of those Kustom amps, like everyone else was using? Stu used the Sunn speaker cabinets. He used two Kustom 400 heads for powering his bass sound. What were the small Fender amps on the Cosmo's Factory album cover used for? John used the small Fender tube amps on certain songs to get a sound the Kustom transistor amps could not produce. Whose toy helicopter was on the same album cover? The chopper in question belonged to Cosmo's son Brent, age 2 then. Did CCR play at Woodstock or not? The answer to many a barroom bet is -- yes. Then why was there no CCR music on the Woodstock album or in the film? John Fogerty felt at the time that the performance was in some ways lacking, and vetoed any of CCR's set from the original soundtrack and film. The 25th Anniversary release did include several songs from CCR's Woodstock performance [Note 1]. The general feeling of fans who have heard this and the entire set is that the band played well. There were numerous technical problems at times, caused by the sound crew, which John was very annoyed at, and rightly so. What kind of odd looking guitar is John holding on the Green River album cover? A Dobro. You can hear it on "Lookin' Out My Back Door". A Dobro is played with a slide and is tuned in open tunings. John used open "G" tuning. Was there really a place called Cosmo's Factory? Absolutely. Cosmo's Factory was the nickname given to the band's rehearsal building. Who is this "Jody" person in several CCR songs? Jody is a name that caught John's fancy and it seemed to work well in those songs. Nothing more. Was "Green River" based on real life happenings? Yes. As teenagers Tom and John went to a creek in northern California on vacation. They would swim and fish in the creek, and there really was a place called Cody's Camp there. Everything mentioned in the song was real and actually took place. The name of the creek was Putah Creek. John changed that to "Green River", for obvious reasons. Why was John the arranger and producer on CCR albums? In a 1976 Rolling Stone magazine interview, John stated that the band kept waiting for Phil Spector or some other well known producer to come along and take the band under their wing. John also said that he believed Fantasy Records must have given the impression to the rest of the music industry that CCR had a gravy deal, because they were only approached a few times by other record companies during their existence. Just how many #1 singles did CCR total up in the USA? None. CCR never hit #1 on the singles chart in the USA. They hit #2 several times, and had many double sided singles on the charts, but never a #1 single. Where was the picture on the cover of "Willy & The Poorboys" taken? On 30th Street near Peralta, right across the street from Fantasy Records (at the time) in Oakland, California. In the tune "Poorboy Shuffle", did the band really play the instruments as seen on the cover, and was the talking and laughing intentional? Yes, those instruments were used. Tom played an authentic "Kalamazoo" guitar found in a San Francisco pawn shop. Stu played a "gut-bucket", and Cosmo played a washboard with thimbles on his fingers. The talking and jiving is intentional in that John did not bother to remove it. How often did CCR practice? Nearly every weekday. It was a formal thing that got started around eleven in the morning. Did John ever study music? Aside from a few folk guitar lessons in junior high school, no. What kind of guitars did John play on stage? John used 3 guitars in the CCR days. A Gibson Les Paul Custom with a 3/4 neck, modified after the original neck was broken by an airline by master luthier Hideo Kamimoto. Kamimoto installed a Bigsby whammy bar on this guitar. Prior to this Les Paul, John used a Rickenbacker 325 with a 3/4 neck, also modified by Kamimoto. Another Les Paul Custom for the 'D' tuned songs and also tweaked by Kamimoto was ever present too. Why did John use Kustom amps in concert when just about everyone else at the time was using tube amps like Fender, Marshall and HiWatt? John says of the Kustom amps, "They had an honest 90 watts RMS power, built-in tremolo and distortion and stomp pedals, and they were pretty dependable. I could stand at a certain spot between the speaker cabinets with the Rickenbacker guitar, and do my feedback thing on "Keep On Chooglin" just right." In those days, how was the stage sound compared to now? According to Stu Cook, "We had microphones on everything back then, and we had a couple of monitor cabinets aimed at us. It was primitive compared to what we have now, but at the time our onstage setup was probably as good as any other acts, and better than most." Why didn't Creedence do any encores at their concerts? John Fogerty felt that encores were a "shuck", and thought that he was being honest with the fans by just playing a set and telling them the last song was indeed the last song. Stu Cook and the rest of the band did not necessarily agree with this. "We played about 50 minutes because that's about how long John's vocals could last", according to Stu Cook. "It was John's call to do the quick shows, but you have to also remember our concert ticket prices were always very reasonable for the those days". Was the song "Lodi" based on a real experience? Stu Cook says, "Yes and no. Every band has a "Lodi" period, and we did prior to the Creedence days. The song was based on Lodi, California, but we never played there, in any form." The song, "Wrote A Song For Everyone" mentions, "Richmond's 'bout to blow up". Is this a reference to the Civil War and Richmond, Virginia? "I'd say John was talking about Richmond, California" says Stu. Richmond is a suburb north of San Francisco. What kind of bass guitar did Stu play? Stu used a Rickenbacker 4000 series and a Gibson SG EB-2 bass. He then settled down with a modified Fender Precision bass guitar, of which Stu says, "I still have it, and it plays pretty good, amazingly enough". What kind of guitar did Tom play? Tom used several guitars over the CCR years, a Rickenbacker 381 was an early choice, followed by Gibson ES-335 and Guild hollowbody guitars. Tom was also fond of Epiphone hollowbody guitars. Is it true John Fogerty did all the vocals on CCR records? No. "Who'll Stop The Rain" is but one example of the band's vocal harmonizing contributions. John did indeed overdub his own vocals on many songs, sometimes using a VFO (variable frequency oscillator) to drop his vocal pitch down for harmonizing on songs like, "The Midnight Special" and "Heard It Through The Grapevine". CCR was the only group to equal the Beatles' record of eight million sellers in one year (1970). CCR paid for all those Kustom amps onstage. They did not have an endorsement deal, and sold thousands of amps for Kustom. Kustom now makes police radar units, tucked and rolled and black. 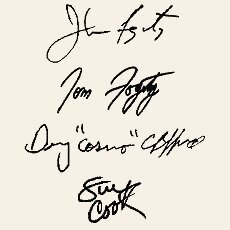 Both Stu Cook and John Fogerty have instrument rated private pilot licenses. CCR had never been anywhere near the Mississippi Delta part of the USA prior to touring after the "Bayou Country" album was released. John Fogerty wears contact lenses. Elvis was very fond of CCR's music. Stu Cook's favorite rock band is The Rolling Stones. "Suzie-Q" was recorded in one take. In the latter stages of CCR's existence, John Fogerty played saxophone, banjo and pedal steel onstage at various CCR concerts. Stu Cook plays bass using his fingers instead of a pick. John Fogerty uses a pick and fingerpicks with his remaining fingers,best example of this is the lead guitar solo from "Proud Mary". Doug Clifford played Camco drums, which were owned at the time by Kustom Electronics. Cosmo presently uses DW, or Drum Works drums, well known in the music business as among the finest drum stuff made. Doug uses 18" high-hats on his drum kit. An 18" cymbal is normally a crash cymbal. The reason Cosmo uses this high hat configuration is the distinctive sound it produces. and hard working road crew. Examples: Jacksonville and Miami, Florida. In 1970, Spiro T. Agnew, then vice president under President Richard M. Nixon, ordered the FCC to determine if the lyrics to the CCR song, "Lookin' Out My Back Door" were drug related. "It Came Out Of The Sky" from the "Willy & The Poorboys" record.